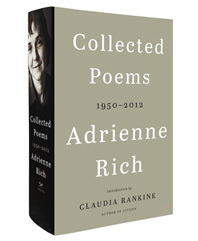 The collected works of Adrienne Rich, whose poetry is "distinguished by an unswerving progressive vision and a dazzling, empathic ferocity" (New York Times). A Finalist for the 2017 Pulitzer Prize in Poetry. Adrienne Rich was the singular voice of her generation and one of our most important American poets. She brought discussions of gender, race, and class to the forefront of poetical discourse, pushing formal boundaries and consistently examining both self and society. This collected volume traces the evolution of her poetry, from her earliest work, which was formally exact and decorous, to her later work, which became increasingly radical in both its free-verse form and feminist and political content. The entire body of her poetry is on display in this vast volume, including the National Book Award–winning Diving Into the Wreck and her prize-winning Atlas of the Difficult World. The Collected Poems of Adrienne Rich gathers and memorializes all of her boldly political, formally ambitious, thoughtful, and lucid work, the whole of which makes her one of the most prolific and influential poets of our time.